A couple of years ago, E and I attended a Scion owners' event that was really fun and sent us home with lots of goodies for our cars. I won a really nice set of rims, which sat in the garage for over a year while I hemmed and hawed over whose car to put them on (they fit both). I finally decided to give them to E since his car needs to look nice for his drive-in movies. I didn't mind as to me, while a car can definitely be an extension of someone's personality, it is primarily utilitarian. When the Scion brand first hit the market in '03, they campaigned as being the cars ideal for personlization. Again, that was never really my thing, but I enjoyed looking at the stuff other folks did to theirs whenever we attended gatherings. There used to be a lot of nifty events, but things changed. There were design changes in '08 that I'm not overly fond of and just looked at the 2010 xB, which is not attractive at all. But, I still love my xA and E's first generation xB. So, what in the world is this all about? Orange hubcaps? What. 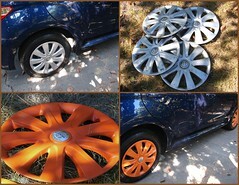 Well, when I was leaning toward giving up the rims, E suggested I could so something funky such as painting my hubcaps orange. Feeling a little guilty owning a Scion that I never modded, I thought it might be a fun thing to do. We had extra hubcaps so figured if it didn't work out it would be no big deal. 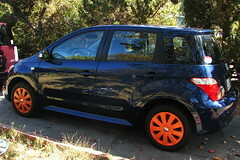 Eventually, we found some spray paint I liked--"pumpkin orange"--and E finished them up for my birthday. If you know me at all, you know I love orange. I've gotten several compliments, as well as a few snide comments, but whatever...I like 'em. Now maybe I'll get around to putting on the spoiler that I also got for free.